Crikey! My last post had the highest number of views I've ever had. 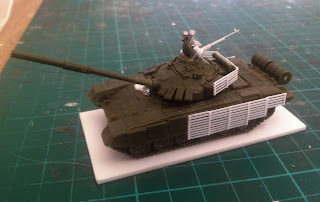 Spurred on by this, I added cage armour to another three Zvezda T-72s to make a platoon. 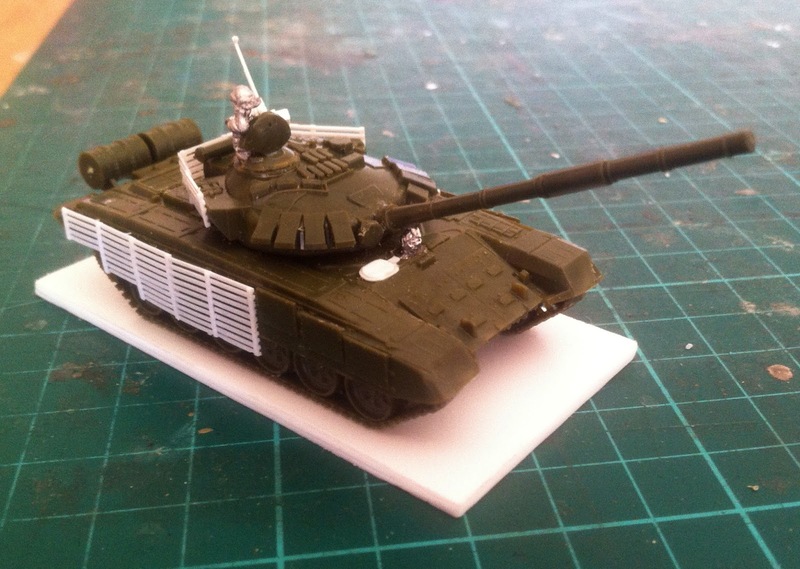 I couldn't resist chopping up the platoon leader's tank a bit more. 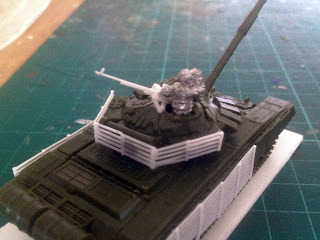 Tank commanders pointing at stuff are ten a penny so I thought I'd add a driver as well. This proved to be a challenge because I wanted to be able to rotate the turret as well, so I had to cut off the gun and reposition it at a higher elevation and file down the underside of the searchlight and bustle racks. I drilled out the driver's hatch and made a new one with plasticard. The turret hatch is just the original hatch carefully cut off and repositioned. The tank commander is from Peter Pig's AK47 range, and the driver came with an Old Glory BMP-1. What I really wanted was an idiot leaning out of the turret swinging a sword around, but you can't have everything. Both minis are glued in position with Poundland epoxy resin. 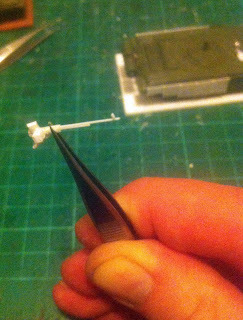 I'm distrustful of anything from Poundland, but their epoxy resin is great, dries quickly, and is a fraction of the price of Araldite. No doubt by now you will have noticed the addition of an NSV machine gun on each tank. 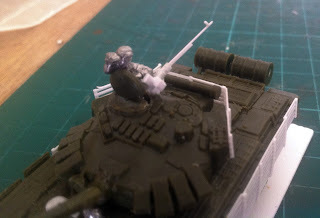 The Zvezda tanks don't come with this gun and that doesn't bother me at all - on a wargames table, I don't really notice that level of detail. 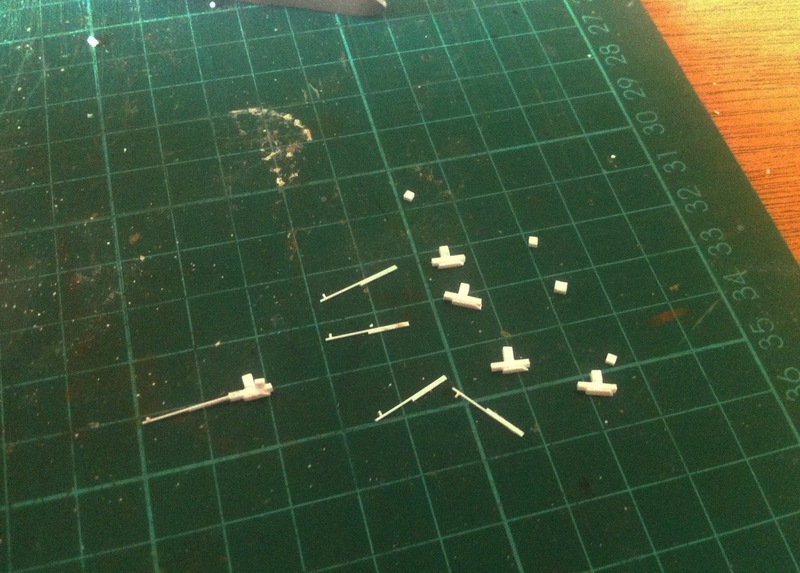 But, in a moment of madness, last night I decided to scratchbuild some. I'm not quite sure why I did it. 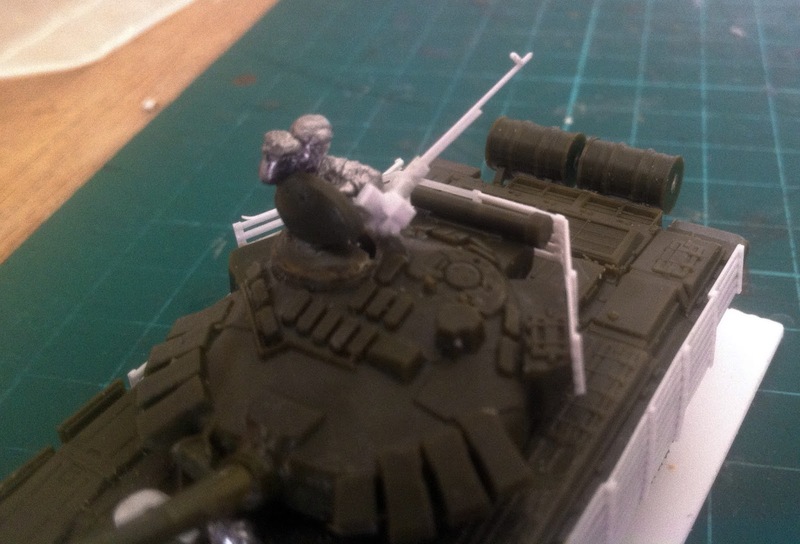 I think it started with the platoon leader's tank - I added the minis then thought the commander looked odd without a machine gun behind him, then I thought the other tanks ought to have machine guns so they matched, then I wondered if I could make something that small. The next thing I knew, it was 5am and I'd made one! ...and recommend buying Battlefront's DSHK guns instead. They're not quite right, being the NSV's predecessor, but who cares? Here's a shot of the first one. 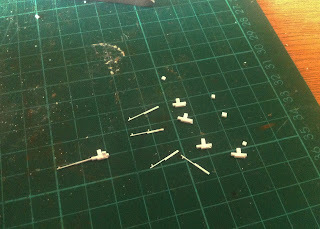 To finish, here are a couple of ropey shots of the gun glued in position. While I wouldn't want to drop the tank on the floor, the gun is stronger than it looks. I feel as confident handling this gun as I do the white metal machine guns on my platoon of QRF T-80s. Nice, your hard work paid off handsomely.